Maps and Data from BSBI, the Botanical Society of Britain & Ireland. Launched in 1950, the BSBI Maps Scheme is one of the world’s longest-running natural history distribution mapping projects. It is constantly updated and improved by the BSBI’s networks of volunteers, County Recorders and Referees, and it is always in use by scientists, conservationists and governmental bodies for determining the abundance, range and changes in the distribution of vascular plants and charophytes in Britain & Ireland. In the 1940s the Ordnance Survey plotted a grid across the whole of Britain based on km squares. 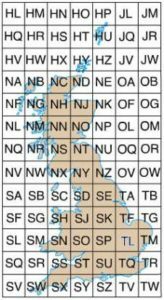 There are some 3,000 10km x 10km squares in this grid, which are given codes such as SX45 or NO66 (S is for the southern 1000km square, N for the northern one), as shown on the map below. For full details of the national grid, visit the Ordnance Survey web site. 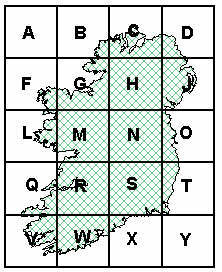 Equivalent grid systems have since been created for Ireland and the Channel Isles. 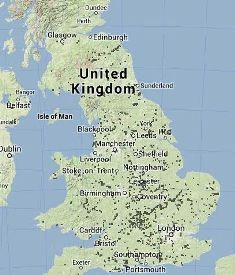 BSBI distribution maps: based on up-to-date data from our live database. The maps show occurrence records at up to 2km resolution. Some of the data are not fully curated, so the maps will include errors; please let us know about any mistakes. NBN Atlas: the UK's National Biodiversity Network collates biological records from diverse sources (including some data from BSBI). The atlas can be a useful resource for viewing species occurrences in a wider context (e.g. combined with a distribution of animals). NBDC: the National Biodiversity Data Centre collates biological records from Ireland. Online Atlas of the British and Irish flora: developed in collaboration with the Biological Records Centre this website displays the maps published in the BSBI's New Atlas of the British and Irish Flora (based on data up to 2000). Data for these maps have been checked carefully. The maps are a good choice if you need dependable and largely error-free information, but are not up-to-date. These are created by recording which species are found within each square of the national grid. The first Atlas was produced by the BSBI in 1962, showing black dots for records since 1930 and open circles for older records. Since 2000 we have been recording in decade-long date classes, so Date Class 6 will be 2020-2029. The website maps summary displays up to tetrad (2km x 2km) resolution, but our database includes finer resolution for most records made since 2000. 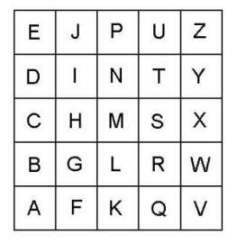 A tetrad is a 2km x 2km square, given a letter code as shown below. So tetrad SW41A is made up of the four 1km squares SW4010, SW4011, SW4110 and SW4111. The BSBI operates a Distribution Database (DDb) as a central store for all our records of plants and charophytes. It contains some 35 million biological records (April 2016) and is growing by approximately one million records every year. It is updated frequently from our network of Mapmate recorders and from other sources such as herbarium digitisation projects. The database stores full details of the BSBI occurrence records and is regularly used by BSBI county recorders and taxon referees, who are responsible for curating the records and correcting mistakes. Licensing and confidentiality constraints and the need to protect sensitive records mean that public access to the database is not available and because this is research-level, live data it is not appropriate for the general public or for consultancies. Filtered, interpreted data can be obtained from local records centres, the NBN Gateway and other public sources. Researchers, conservation workers and volunteers collaborating on BSBI projects may also be granted access, on a case-by-case basis. To discuss use of the database, please contact Kevin Walker. Go to the BSBI Distribution Database (DDb). The system of counties and vice-counties was devised in the 1870s to create 113 units of roughly equal size covering the whole of Britain (the process was later repeated in Ireland). The boundaries of the vice counties do not change with political reorganisation so have remained the same ever since. Click on the link below for a handy web page showing the vice counties. Vice county boundaries (Britain only).